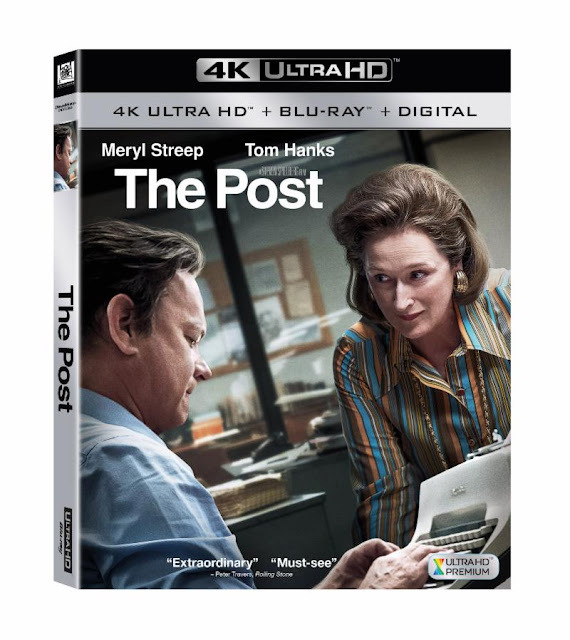 The Post will arrive on BLu-Ray and DVD on April 3rd. That's another one to add to your Spielberg collection. OSCAR ® winners Steven Spielberg, Meryl Streep, and Tom Hanks team up for the first time in this thrilling film based on a true story. Determined to uphold the nation's civil liberties, Katharine Graham (Streep), publisher of The Washinton Post, and hard-nosed editor Ben Bradlee (Hanks) join forces to expose a decades-long cover-up. But the two must risk their careers -- and their freedom -- to bring truth to light in this powerful film with a celebrated cast. THE POST is "extraordinary...must-see" film according to Peter Travers of Rolling Stone and the home entertainment release features 90 minutes of bonus content, depicting the real life events behind the groundbreaking untold story and the journey to bring it to the big screen. Blu-ray™ and DVD on April 17. - Get to know the brave real-life characters at the heart of this story, Kay Graham and Ben Bradlee, who risked everything to tell the truth. - Learn how, once Steven Spielberg, Meryl Streep and Tom Hanks agreed to make this important film, other world-class actors also signed on! - Visit the 1970s and the Washington Post newsroom in this engaging exploration of how the style of The Pentagon Papers era was created. - You’re invited onto the set with Steven Spielberg, his collaborators and his cast as they meticulously craft each cinematic moment. - Steven Spielberg and composer John Williams celebrate their 44-year partnership in this moving tribute to collaboration and friendship.